Does More Content Mean More Traffic? Since the conception of Internet Marketing, it has been constantly said and believed that “content is the king”. SEO experts keep saying the same mantra, “keep your website updated and post as much content as possible”. But recently I have noticed that adding more and more content does not guarantee an increase in the amount of traffic. To put it in simple words, if you are of a belief that the more pages that you add, you would have a higher chance of getting ranked on wide range of keywords and eventually get more traffic from major search engines, then you are in for some disappointment. You might come and say that it is true as so many other big blogs perform so well in terms of traffic. But, Google doesn’t follow this theory. According to Google, quality is more important that quantity. Thus, each one of the SEO Copywriter need to ensure that even though adding thousands of pages is a good thing, but they need to be very careful and evaluate whether that content will offer value to their readers or not. Each and every article should be worth a read. So, I would say the equation in SEO writing should be – More Quality Pages = Better Ranking = More Traffic. Google Labs have come up with a new tool that allows users to convert Flash SWF files to HTML5. The cool tool, Swiffy, allows users to reuse the Flash content on devices that do not support Flash players such as iPhones and iPads. Swiffy currently supports a subset of SWF 8 and ActionScript 2.0, and the output is generated in all the Webkit browsers such as Chrome and Safari. If you want to try it out, then go here. Google News recently made a new update to crawl the news using Googlebot. Well, it might not be a very important update for most of the publishers and thus, news organizations who wish to opt out of Google News can do that. But I’m sure that none of them would want to do that considering the reach of Google News network. You will only see Googlebot user-agent in your website’s traffic logs. Google has clarified though that Googlebot instead of Googlebot-News does not matter as long as inclusion policies are concerned. So, if you opted out of Googlebot crawling your news and you see Googlebot coming in your traffic logs, don’t panic. Google respects your decision but is just trying to make the naming conventions standard. Moreover, if you still have doubts, you can check your website in Google News search bar by typing, site:abc.com. If you are using any analytics tool, then you should be able to see two sets of traffic just like before, one coming from Google Search and one coming from Google News. The only difference is that the automated visits from Googlebot-news crawler will not longer be visible. If your website is complying to the guidelines for Googlebot then you don’t have to make any changes to your website. Though the websites that require login or registration before displaying the full article, Google News will only be able to crawl the text that is visible prior to login. The News Sitemap of websites will still be crawled in the normal way. So, the news publishers who have not setup a news sitemap, this is a good wakeup call for you guys to make one. To summarize in simple words, any news publishers who wish to opt out of Google News and want to stay in Google Search can disallow the news bot and allow the search bot. You can check out the help article on how to do this here. From SEO or Marketing perspectives, I’m really not sure how this update would help, but let’s see how many news websites go for the change. TV Ad makers have long struggled to calculate their ad’s conversion rate. Despite the fact that TV constitutes the majority of the marketing budget, its success rate can only be calculated based on hypothesis. However, companies such as HTC and PepsiCo are trying to use mobile apps to track the performance of their TV ads. In June, HTC launched a new campaign in collaboration with Google’s Goggles app in order to promote the new HTC Sensation 4G smartphone. The campaign is running across various channels including TV, print and HTC has deployed mobile content specific to each channel. So, this is how the campaign goes. You are seen a preview of the ad. Customers who scan the ad using the Google app can view an extended version of a video featured in the ad. To promote it further in the social media, customers also have an option of connecting to their Facebook account and sharing it with their friends. This way, HTC can measure how many viewers scanned the ad, how many connected via Facebook, how many shared the video and lot more other metrics. Earlier companies used to measure their TV ad performance by measuring the sales volume in the regions where the ad was broadcast. But imagine how tough it would be to measure the performance in case of ads that are shown nationwide, or worldwide. With mobile tagging, the brands can measure their ad performance with more depth and insight and use the data to improve their ad performance, not to mention the increase in the ROI with the integration of all the channels with a mobile app. Moreover, if you calculate the cost, then mobile delivery method is not a significant investment compared to other coupon methods such as print. Such apps have definitely opened doors for more apps, and bigger markets for the mobile developers. I’m sure that in near future, this strategy would be adopted by many companies especially the ones dealing with coupons and promotions on consumer goods. Consumers no longer have to note down the promotion codes on paper, or cut sunday newspaper clippings. All they need to do is scan the ad, and redeem the coupon at the retail store via their mobile. Though it can get challenging for a consumer to recognize a TV spot’s mobile delivery capability and then launch the corresponding mobile app within 30 second time frame, but I suppose with time, this shortcoming will also be achieved. Internet is overflowing with the number of websites. Countless websites are coming up everyday and a lot of them are just spam websites used either for link farming or adsense. It usually gets frustrating to actually hunt through these websites and get to the ones that are real. Now you can report these websites as Webspam, i.e. those sites that violate the Google’s webmaster guidelines and use some black hat tricks to get ranked higher. Google now has a improved webspam reporting form where it is very easy to report a spam and also enables Google to keep its index clean. You can report various types of search issues. Paid links, Copyright issues, Objectionable content, Malware Phishing are some of the issues that you can report. In the previous form, users didn’t have many options to select and thus, most of the time they ended selecting others. Google identified this to cause delay in the process of marking a website as spam and thus, it hopes that with the introduction of more nuclear choices, it will be able to make this process faster. There are helpful links to understand each issue better. With each of the option, there is a corresponding link which users can click to get more understanding about that particular spam. For those who might be worried whether their website is violating any guidelines or not can also now go and read the help section and improve their websites. There is a customized thank you page having multiple options. It tells the users what happens to the spam website they submitted. It also provides an option to report more spams and gives information on how one can block certain websites from appearing in their personalized search results. It is a good initiative to keep the search indexes clean and healthy, but it also now creates new implications on webmasters in terms of improving the quality of their websites. If reported to Google, they can find themselves in deep trouble. Time for everyone to clean their websites and not be part of the spam activities. There is very little information known to most of the marketers about Google Trends. The truth is that most of the marketers are not even aware of how to use Google Trends to their benefit. But Google Trends is not some ordinary marketing tool, and if used wisely it can give a real boost to all your marketing efforts. So, what exactly is Google Trends? Google Trends is a free service that shows how often a keyword is entered relative to the total search-volume across various regions of the world, and in various languages. With Google Trends you can compare how the world is interested in your favorite topics. For example, if you are interested in top car models, enter up to 5 of your favorite models and see how they have been searched on Google over time. Not only search, but Trends shows how often those search terms have appeared in Google News and in different geographic areas. The best part is that the information in trends is updated daily based on the search behavior of users around the globe. The fact that you can checkout trends in different areas and in languages, makes it a very important tool for people who are into local search marketing. How does Google Trend work? Google Trends works by analyzing a portion of Google’s web searches. When you type in a keyword in search box, it calculates how many searches were made for that keyword and then it compares it to the total number of searches made over a period of time. 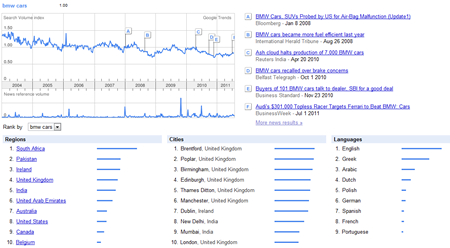 Below is an example of a search that I made for BMW cars on Google Trends. The graph shows the trend over a span of 7 years starting from 2004. Notice, the news results that are coming on the right, they are the results about the news articles that mention BMW cars. In the bottom, you can see the trends in various regions, cities and languages, which you can use to tweak your local internet marketing strategies. This is just a result of 1 keyword, if you key in 5 keywords, you can compare the trends and thus decide which keyword is more suitable to target. For example, if you want to find compare different types of cars, then you should type bmw, mercedes, jaguar in Google Trends search bar. If you wish to exclude some words from search then you can use the minus sign and if you wish to search in a particular order then use quotation marks. Google Trends is a very powerful tool for today’s marketers. Make sure you use them in your marketing strategy. When Google had purchased ITA, everyone anticipated Google to overtake Yahoo Travels and become of the leading destinations of travel information. But nothing much happened, but now it looks like Google would be planning for a strong footmark in the web travel world. It’s most recent experimental tool, the Google Hotel Finder, maybe a beginning of the search giant into this industry. So what is Google Hotel Finder? Unlike its earlier unnecessary projects, this time Google has decided to come up with only the serious projects. First it was the recent launch of Google Plus and now Hotel Finder. So as you can expect, Hotel Finder is loaded with some serious features which sure can give a sore eye to its competitors. To begin with, Google has made easy search of hotels, all you need to do is add the location name and zip code and it will give you the most relevant listings. Each hotel page is a combination of important data that is easy to go through with just a glimpse. There are shortcut keys as well to flip back and forth between the hotels. The best part is, just like bookmarks, you can shortlist hotels and compare them later on. Now what’s in there for SEO experts and online marketers? 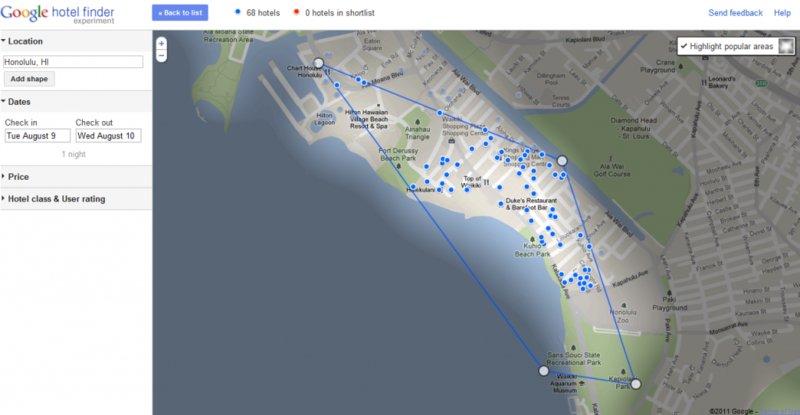 Google Hotel Finder has deep integration with Google Places. So, you don’t really need to key in all the information about hotels again, all the information like images, reviews, rates, etc are imported from the Places page to the Hotel Finder. If you are promoting a hotel, then simply optimize for Google Places and you in turn would also be optimizing for Hotel Finder. The areas with white highlights are popular tourist attractions and blue lines around them are generated automatically by Google. So, based on how convenient it is to go to these attractions, Google Hotel Finder pulls out the hotels. The blue lines can be extended to cover any attractions you wish to receive. So, if you want to or don’t want to visit any attraction, simply drag the blue lines and get the hotels accordingly. Right now, as expected with all Google products, it is only available for USA, but it would be nice to have it in other countries as well. I feel Google has got itself a winner this time in the travel search market so let’s see how the success of this project shapes up.